Old Navy is having a huge CLEARANCE event starting today! 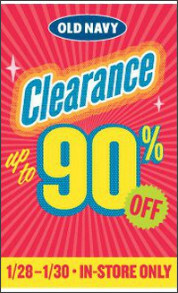 Prices are up to 90% off when you take an additional 30% off the clearance prices. You can read more about it on the Old Navy Facebook wall. I wanted to get there this morning to have first dibs at the bargains, but to be honest I was disappointed overall. 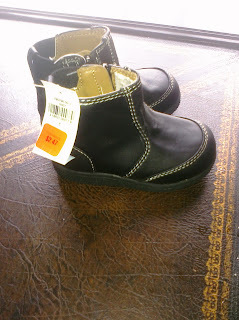 Yes, I did get these boots for my son for only $1.73 . . .but that's all I found!!! Maybe you'll have better luck! Head on over to Barker's Bones to "dig up" a coupon. I got a $5 off $50. Come back & share your finds with us! ohhhh WOW!!! Your son must have the cutest baby feet EVER!!! !